The studies that used high-dose Ginkgo (240 mg/day) all favored treatment vs. placebo. Benefits in “activities of daily living”, “cognition and accompanying psychological symptoms” were noted. Nice article. I always enjoy reading your blog. I routinely take milk thistle periodically throughout the year to aid in liver detoxification. I also like it because it increases glutathione and SOD production in the liver. From my understanding, these powerful enzymes are much more effective means of attaining a higher antioxidant status in the body than simply taking dietary antioxidants from food. I’ve never taken Gingko, but I think I’m going to try it. Aim: Diabetes is a serious metabolic disorder and oxidative stress and inflammation contribute to its pathogenesis and complications. Since Silybum marianum (L.) Gaertn. (silymarin) extract is an antioxidant with anti-inflammatory properties, this randomized clinical trial was conducted to evaluate the effects of silymarin supplementation on oxidative stress indices and hs-CRP in type 2 diabetes mellitus patients. Methods: For the present paralleled, randomized, triple-blinded, placebo-controlled clinical trial, 40 type 2 diabetes patients aged 25–50 yr old and on stable medication were recruited from the Iranian Diabetes Society and endocrinology clinics in East Azarbayjan (Tabriz, Iran) and randomly assigned into two groups. Patients in the silymarin treatment group received 140 mg, thrice daily of dried extracts of Silybum marianum (n = 20) and those in the placebo group (n = 20) received identical placebos for 45 days. Data pertaining to height, weight, waist circumference and BMI, as well as food consumption, were collected at base line and at the conclusion of the study. Fasting blood samples were obtained and antioxidant indices and hs-CRP were assessed at baseline, as well as at the end of the trial. Results: All 40 patients completed the study and did not report any adverse effects or symptoms with the silymarin supplementation. Silymarin supplementation significantly increased superoxide dismutase (SOD), glutathione peroxidase (GPX) activity and total antioxidant capacity (TAC) compared to patients taking the placebo, by 12.85%, 30.32% and 8.43%, respectively (p < 0.05). There was a significant reduction in hs-CRP levels by 26.83% (p < 0.05) in the silymarin group compared to the placebo group. Malondialdehyde (MDA) concentration significantly decreased by 12.01% (p < 0.05) in the silymarin group compared to the baseline. Conclusions: Silymarin supplementation improves some antioxidant indices (SOD, GPX and TAC) and decrease hs-CRP levels in T2DM patients. Minerva Med. 2014 Dec;105(6 Suppl 2):1-8. Effect of Liverubin™ on hepatic biochemical profile in patients of alcoholic liver disease: a retrospective study. Liverubin™ is an available drug in the Indian market that contains silymarin, the major active complex extracted from the medicinal plant milk thistle (Silybum marianum L.). The study retrospectively tracked and analyzed the data of 602 patients, out of which 230 were alcohol induced; 131 with alcohol-induced liver damage (ALD), 13 with liver cirrhosis, and 86 with fatty liver; to assess the effects of water soluble Silymarin (Liverubin™) on important hepatic biochemical parameters. The data was collected from 32 major cities treated by 72 physicians across India who were observed for the specified treatment duration of 11 months. Data was analyzed by using descriptive statistics. At the end of the treatment the hepatic biochemical profile was appreciably improved: the mean % of change in the levels of important hepatic biochemical parameters was observed as follows: total bilirubin 63.48% (direct bilirubin: 64.96%; indirect bilirubin: 61.63%). The serum SGOT and SGPT changed at a mean % of 65.43 and 69.31 respectively while serum alkaline phosphatase was changed at a mean % rate of 39.81. Liverubin™ proved to be safe & well-tolerated among the studied population and no significant treatment related adverse events were reported during the study. Liverubin™ treatment is found to bring about effective lowering of abnormally elevated hepatic biochemical parameters. Liverubin™, water soluble active Silymarin, in the popularly prescribed doses of 140-mg tid is observed to be a promising safe and effective drug in cases of alcoholic liver disease. MMW Fortschr Med. 2014 Dec 15;156 Suppl 4:120-6. [Effect of silymarin on liver health and quality of life. Results of a non-interventional study]. BACKGROUND: Many drugs are known to have hepatotoxic side effects. The effect of silymarin on liver function and liver-injury-impaired quality of life under daily practice conditions in patients with elevated values of liver enzymes was evaluated in the present non-interventional study. METHOD: Patients with drug-induced elevated aminotransferase levels and indication for silymarin (Legalon forte) treatment for 2 to 3 months were documented prospectively over 4 months. At baseline, after 2 and 4 months, respectively, the following parameters were documented: alanine transaminase (ALT), aspartate transaminase (AST), γ-glutamyltransferase (GGT), alkaline phosphatase, total bilirubin, presence of liver-related skin symptoms and discoloured urine, severity of liver-related symptoms and quality of life. RESULTS: In total, 190 patients (53.2% male, median age 60.0 years [range 19-81]) from 48 centres participated in the non-interventional study. Among potentially hepatotoxic drugs, analgesics/anti-inflammatory drugs were used most frequently (45.8%). These drugs have been administered for a median period of 2.8 years (range 0.0-26.1). At baseline, all patients had elevated levels of ALT, AST or GGT. Fatigue, flatulence, upper abdominal discomfort, lethargy, and joint complaints were the most severe liver-related symptoms and prevalent in over 62% of patients. Quality of life was affected in 88.7% of patients. Significant reductions were achieved in all documented laboratory parameters (p < 0.001), leading to marked improvement in liver-related symptoms and increased quality of life already after 2 months. The percentage of patients with liver enzymes in the normal range increased considerably within 4 months. No adverse drug reactions were observed. CONCLUSIONS: Silymarin is a safe and efficacious treatment option for patients with elevated liver enzymes. A benefit in terms of liver-related symptoms as well as quality of life and performance was demonstrated already after 2 months of treatment. Background/Objectives: Human milk (HM) is the best possible food for all infants, especially for preterm ones, but lactation and breastfeeding are very difficult for mothers of preterm babies and high rates of breastfeeding difficulties have been reported. Our aim was to investigate the efficacy of a galactogogue containing silymarin-phosphatidylserine and galega in increasing milk production during the first month after delivery in a population of mothers of preterm infants. Subjects/Methods: Mothers of infants with gestational age (GA) between 27+0 and 32+6 weeks were enrolled in this prospective, double-blind, randomized trial and were randomly allocated to receive either the galactogogue containing silymarin-phosphatidylserine and galega, 5 g/day (galactogogue group, GG), or a placebo, 5 g of lactose per day (placebo group, PG) from the 3rd to the 28th day after delivery. Results: Fifty mothers were included in each group. General characteristics of mothers and pregnancies were similar. Milk production was significantly greater in the GG at the 7th day of life and at the 30th day of life. Daily milk production from the 7th to the 30th day of life was 200 (110–380) ml in the GG vs 115 (60–245) ml in the PG (P<0.0001). The total production of milk during the study period was significantly higher in the GG (6523±5298 ml vs 4136±4093 ml; P<0.02). At the end of the study, 45 mothers of the GG were able to reach the target of milk supply of 200 ml/day compared with 25 mothers of the PG (P<0.01). No adverse reactions were noticed in the study groups. Conclusions: Silymarin-phosphatidylserine and galega increased milk production in mothers of preterm infants without any significant side effects. Silymarin in Type 2 Diabetes Mellitus: A Systematic Review and Meta-Analysis of Randomized Controlled Trials. Type 2 diabetes mellitus (T2DM) is associated with increased risk of cardiovascular disease and nephropathy-now the leading cause of end-stage renal disease and dialysis in Europe and the United States. Inflammation and oxidative stress play a pivotal role in the development of diabetic complications. Silymarin, an herbal drug with antioxidant and anti-inflammatory properties, may improve glycemic control and prevent the progression of the complications. In a systematic review and meta-analysis including five randomized controlled trials and 270 patients, routine silymarin administration determines a significant reduction in fasting blood glucose levels (-26.86 mg/dL; 95% CI -35.42-18.30) and HbA1c levels (-1.07; 95% CI -1.73-0.40) and has no effect on lipid profile. Benefits for silymarin on proteinuria and CKD progressions are reported in only one small study and are uncertain. However, being aware of the low quality of the available evidence and elevated heterogeneity of these studies, no recommendation can be made and further studies are needed. BMC Psychiatry. 2016 Nov 15;16(1):398. Silybin supplementation during HCV therapy with pegylated interferon-α plus ribavirin reduces depression and anxiety and increases work ability. BACKGROUND: Hepatitis C virus infection and interferon treatment are often associated with anxiety, depressive symptoms and poor health-related quality of life. To evaluate the Silybin-vitamin E-phospholipids complex effect on work ability and whether health related factors (anxiety and depression) were associated with work ability in subjects with chronic hepatitis C treated with Pegylated-Interferon-α2b (Peg-IFN) and Ribavirin (RBV). METHODS: Thirty-one patients (Group A) with chronic hepatitis and other 31 subjects in Group B were recruited in a randomized, prospective, placebo controlled, double blind clinical trial. Group A received 1.5 mg/kg per week of Peg-IFN plus RBV and placebo, while Group B received the same dosage of Peg-IFN plus RBV plus association of Silybin 94 mg + vitamin E 30 mg + phospholipids 194 mg in pills for 12 months. All subjects underwent to laboratory exams and questionnaires to evaluate depression (Beck Depression Inventory – BDI), anxiety (State-trait anxiety inventory – STAI) and work ability (Work ability Index – WAI). RESULTS: The comparison between group A and group B showed significant differences after 6 months in ALT (P < 0.001), and viremia (P < 0.05), after 12 months in ALT (P < 0.001), and AST (P < 0.001), at follow up in AST (P < 0.05), and ALT (P < 0.001). Significant difference were observed after 1 month in WAI (p < 0.001) and BDI (P < 0.05), after 6 months in WAI (P < 0.05) and STAI (P < 0.05), after 12 months and at follow up in WAI, STAI and BDI (p < 0.01). CONCLUSIONS: The supplementation with Silybin-vitamin E -phospholipids complex increased work ability and reduced depression and anxiety in patients treated with Peg-IFN and RBV. Ginkgo Biloba Extract EGb 761 Alleviates Hepatic Fibrosis and Sinusoidal Microcirculation Disturbance in Patients with Chronic Hepatitis B. BACKGROUND: Few clinical data are available regarding the effect of Ginkgo biloba extract (EGb 761) on liver microcirculation and fibrosis. This randomized, controlled trial is to investigate the effect of Ginko biloba extract EGb 761 on liver fibrosis and hepatic microcirculation in patients with chronic hepatitis B. METHODS: Sixty-four patients with chronic hepatitis B were randomized for intention-to-treat. Thirty-two patients were assigned to treated group receiving EGb 761 plus polyunsaturated phosphatidylcholine (Essentiale), 32 patients received Essentiale as controls. Blood samples were taken for measurement of transforming growth factor beta-1 (TGF-β1), platelet activate factor (PAF), endothelin 1 (ET-1). Twenty-six patients in treated group and 21 patients in control group underwent liver biopsies for histology before and after treatment. Ultrastructural study for sinusoidal microcirculation before and after treatment was carried out on 10 randomly selected patients in each group. RESULTS: In the treated group, after EGb 761 treatment, there was a significant reduction of blood TGF- β1, PAF and ET-1 (p<0.05), whereas this was not observed in the controls. After treatment in both groups, there were significant decrease of ALT, TBil and PT (p<0.05), and significant increase of ALB (p<0.05). Hepatic inflammation and fibrosis significantly alleviated in the treated group, but not in the controls. After EGb 761 treatment, electron microscopy showed red blood cell aggregates and microthrombosis disappeared or decreased in sinusoids; collagen deposits in sinusoidal lumen and Disse space reduced; sinusoidal capillarization alleviated. CONCLUSIONS: EGb 761 can improve sinusoidal microcirculation, alleviate inflammation and inhibit fibrosis through multiple mechanisms, it is effective in the treatment of chronic liver diseases. Aging Clin Exp Res. 2017 Feb 8. Ginkgo biloba special extract LI 1370 improves dual-task walking in patients with MCI: a randomised, double-blind, placebo-controlled exploratory study. BACKGROUND: In patients with mild cognitive impairment (MCI), gait instability, particularly in dual-task situations, has been associated with impaired executive function and an increased fall risk. 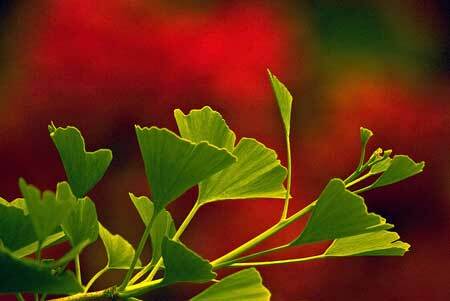 Ginkgo biloba extract (GBE) could be an effective mean to improve gait stability. AIMS: This study investigated the effect of GBE on spatio-temporal gait parameters of MCI patients while walking under single and dual-task conditions. METHODS: Fifty patients aged 50-85 years with MCI and associated dual-task-related gait impairment participated in this randomised, double-blind, placebo-controlled, exploratory phase IV drug trial. Intervention group (IG) patients received GBE (Symfona® forte 120 mg) twice-daily for 6 months while control group (CG) patients received placebo capsules. A 6-month open-label phase with identical GBE dosage followed. Gait was quantified at months 0, 3, 6 and 12. RESULTS: After 6 months, dual-task-related cadence increased in the IG compared to the CG (p = 0.019, d = 0.71). No significant changes, but GBE-associated numerical non-significant trends were found after 6-month treatment for dual-task-related gait velocity and stride time variability. DISCUSSION: Findings suggest that 120 mg of GBE twice-daily for at least 6 months may improve dual-task-related gait performance in patients with MCI. CONCLUSIONS: The observed gait improvements add to the understanding of the self-reported unspecified improvements among MCI patients when treated with standardised GBE. Drug Des Devel Ther. 2018 Apr 5;12:735-742. The efficacy and safety of Ginkgo biloba extract as an adjuvant in type 2 diabetes mellitus patients ineffectively managed with metformin: a double-blind, randomized, placebo-controlled trial. Background and aim: Type 2 diabetes mellitus (T2DM) is one of the major diseases confronting the health care systems. In diabetes mellitus (DM), combined use of oral hypoglycemic medications has been shown to be more effective than metformin (Met) alone in glycemic control. This study determined the effects of Ginkgo biloba (GKB) extract as an adjuvant to Met in patients with uncontrolled T2DM. Subjects and methods: Sixty T2DM patients were recruited in a randomized, placebo-controlled, double-blinded, and multicenter trial. The patients, currently using Met, were randomly grouped into those treated with either GKB extract (120 mg/day) or placebo (starch, 120 mg/day) for 90 days. Blood glycated hemoglobin (HbA1c), fasting serum glucose, serum insulin, body mass index (BMI), waist circumference (WC), insulin resistance, and visceral adiposity index (VAI) were determined before (baseline) and after 90 days of GKB extract treatment. Results: GKB extract significantly decreased blood HbA1c (7.7%±1.2% vs baseline 8.6%±1.6%, P<0.001), fasting serum glucose (154.7±36.1 mg/dL vs baseline 194.4±66.1 mg/dL, P<0.001) and insulin (13.4±7.8 μU/mL vs baseline 18.5±8.9 μU/mL, P=0.006) levels, BMI (31.6±5.1 kg/m2 vs baseline 34.0±6.0 kg/m2, P<0.001), waist WC (102.6±10.5 cm vs baseline 106.0±10.9 cm, P<0.001), and VAI (158.9±67.2 vs baseline 192.0±86.2, P=0.007). GKB extract did not negatively impact the liver, kidney, or hematopoietic functions. Conclusion: GKB extract as an adjuvant was effective in improving Met treatment outcomes in T2DM patients. Thus, it is suggested that GKB extract is an effective dietary supplement for the control of DM in humans. Lower glycemic indices and lipid profile among type 2 diabetes mellitus patients who received novel dose of Silybum marianum (L.) Gaertn. (silymarin) extract supplement: A Triple-blinded randomized controlled clinical trial. OBJECTIVE: This randomized clinical trial was conducted to evaluate the effects of silymarin supplementation on glycemic indices and serum lipid profile in type 2 diabetes mellitus (T2DM) patients. METHODS: 40 T2DM patients (twenty male and twenty female), 25-50 years of age and on stable medication, were recruited for the present paralleled, randomized, triple-blinded, placebo-controlled clinical trial. The participants were randomly assigned to the silymarin or placebo groups, in which the patients either received 140 mg of silymarin, thrice daily (n = 20) or placebo (n = 20) for 45 days. Anthropometric and dietary intake data were collected at the baseline and end of the trial. Fasting blood samples were collected, and glycemic indices and lipid profile were determined at baseline, as well as the end of the study. RESULTS: Silymarin supplementation led to significant reduction in fasting blood sugar, serum insulin, homeostatic model assessment for insulin resistance, serum triglyceride and triglyceride to high-density lipoprotein cholesterol ratio as compared to the placebo, by 11.01, 14.35, 25.92, 23.7 and 27.67% respectively. There was significant increase in high-density lipoprotein cholesterol levels and quantitative insulin sensitivity check index in the silymarin group as compared to the placebo group, by 6.88 and 5.64% respectively, (p < 0.05). Total cholesterol and low-density lipoprotein cholesterol concentrations significantly decreased in the silymarin group as compared to the baseline, by 7.93 (p = 0.001) and 7.15% (p = 0.02), respectively. CONCLUSION: Silymarin supplementation may improve the glycemic indices and lipid profiles of T2DM patients. More studies are needed to validate the adjunct use of silymarin for metabolic control of T2DM patients. Ther Clin Risk Manag. 2018 Jul 11;14:1219-1226. Efficacy and safety of Ginkgo biloba extract as an “add-on” treatment to metformin for patients with metabolic syndrome: a pilot clinical study. Background and aim: Ginkgo biloba (GKB) extract has shown to be beneficial in experimental models of metabolic and inflammatory disorders such as diabetes and metabolic syndrome (MTS). The objective of this pilot clinical study was to evaluate the effects of GKB extract as an “add-on” treatment with metformin (Met) in MTS patients. Patients and methods: We performed a randomized, placebo-controlled, double-blinded clinical study in subjects with MTS. Forty patients completed the 90-day clinical trial and were randomly allocated to administer either GKB extract (120 mg capsule/day) or placebo (120 mg starch/day) as an add-on treatment with their currently used doses of Met for 90 days. During the study, body mass index (BMI), waist circumference (WC), serum leptin, glycated hemoglobin (HbA1c), fasting serum glucose (FSG), insulin, insulin resistance (IR), visceral adiposity index (VAI), lipid profile, and the inflammatory markers high sensitive C-reactive protein (hsCRP), tumor necrosis factor-α (TNF-α), and interleukin-6 (IL-6) were evaluated. Results: GKB extract significantly decreases HbA1c, FSG and insulin levels, IR, BMI, WC, VAI, serum leptin, and the inflammatory markers compared to baseline values. Simultaneously, GKB did not negatively affect the functions of the liver, kidney, and hematopoietic system. Conclusion: The use of GKB extract as an adjuvant with Met was effective in improving the outcome of patients with MTS. Phytother Res. 2018 Nov 27. Topical silymarin administration for prevention of acute radiodermatitis in breast cancer patients: A randomized, double-blind, placebo-controlled clinical trial. Radiation-induced dermatitis is one of the most common side effects of radiotherapy. Silymarin, a flavonoid extracted from the Silybum marianum, exhibits antioxidant and anti-inflammatory activities. The purpose of this study was to investigate the efficacy of silymarin gel in prevention of radiodermatitis in patients with breast cancer. During this randomized, double-blinded, placebo-controlled clinical trial, the preventive effect of silymarin 1% gel was assessed in comparison with placebo, on radiodermatitis occurrence. Forty patients randomly received silymarin gel or placebo formulation on chest wall skin following modified radical mastectomy, once daily starting at the first day of radiotherapy for 5 weeks. Radiodermatitis severity was assessed weekly based on Radiation Therapy Oncology Group (RTOG) and National Cancer Institute Common Terminology for Adverse Events (NCI-CTCAE) criteria radiodermatits grading scale for 5 weeks. The median NCI-CTCAE and RTOG scores were significantly lower in silymarin group at the end of the third to fifth weeks (p value < 0.05). The scores increased significantly in both placebo and silymarin groups during radiotherapy, but there was a delay in radiodermatitis development and progression in silymarin group. Prophylactic administration of silymarin gel could significantly reduce the severity of radiodermatitis and delay its occurrence after 5 weeks of application.